The Battle of Prairie Grove was the last time two armies of almost equal strength faced each other for control of northwest Arkansas and Missouri. When the Confederate Army of the Trans-Mississippi withdrew from the bloody ground on the night of December 7th, it seemed clear that Missouri and northwest Arkansas would remain under Federal protection. Cavalry raids and guerrilla warfare continued to plague the region until the war finally ended in 1865. Major General Thomas C. Hindman’s Confederate Army of the Trans-Mississippi attacked the Union Army of the Frontier under the command of Brigadier Generals James G. Blunt and Francis J. Herron on December 7, 1862. There were about 12,000 in the Southern Army from Arkansas, Missouri, Texas, as well as the Cherokee and Creek Nations. The Federal Army had about 10,000 soldiers from Arkansas, the Cherokee and Creek Nations, Illinois, Indiana, Iowa, Kansas, Missouri, and Wisconsin. The battle took place near the Illinois River on a ridge and valley called “Prairie Grove,” named after the small log church which sat upon the high ground. The battle began at dawn with the defeat of Union cavalry by Confederate horse soldiers a few miles south of the ridge. The Federals retreated towards Fayetteville with the Southern cavalry in pursuit. The panicked Union soldiers stopped running when General Herron shot one soldier from his horse. The Confederate cavalry skirmished with Herron’s troops before falling back to the Prairie Grove ridge where General Hindman’s Confederate infantry and artillery waited in the woods in a line of battle. After crossing the Illinois River under artillery fire, Herron’s Union artillery exchanged fire with the Confederate cannons near the home of Archibald Borden. The superior range, accuracy, and number of Union guns silenced the Southern batteries, allowing the remainder of the Union army to position themselves for an attack of the ridge. Before charging the high ground, the Federals pounded the ridge with cannon fire for almost two hours. The Twentieth Wisconsin and Nineteenth Iowa Infantry regiments crossed the open corn and wheat fields before surging forward up the slope, capturing the Confederate cannons of Blocher’s Arkansas Battery. They continued to advance until suddenly; the woods erupted with small arms and cannon fire. The Confederates surrounded the two Union regiments on three sides and quickly forced them to retreat to the safety of the Federal guns in the valley. The Confederates under General James F. Fagan counterattacked down the slope onto the open ground where they were met with case shot and canister fire from the Union artillery and hastily returned to the cover of the wooded ridge. Again the Union Army attacked sending the Thirty-seventh Illinois and Twenty-sixth Indiana Infantry regiments up the hill into the Borden apple orchard. Lieutenant Colonel John Charles Black of the Thirty-seventh Illinois led the way with his right arm in a sling, caused from a wound received nine months earlier at Pea Ridge, and wearing a red cape. Outnumbered, the Federals fell back to a fence line in the valley where they stopped a second Confederate counterattack using the Colt revolving rifles carried by the men of companies A and K in the Thirty-seventh Illinois Infantry. The Confederates began massing their troops on the right flank of General Herron’s blue clad troops in order to overwhelm the outnumbered Federals. Before they could attack, two cannon shots rang out from the northwest, announcing the arrival of General James G. Blunt’s Kansas Division who quickly deployed and assaulted the Confederate left flank. Blunt’s Union soldiers were at Cane Hill that morning expecting to be attacked by the Confederate Army. When they heard the roar of battle at Prairie Grove, they marched to the battlefield arriving in time to save General Herron’s command. The Southern Army responded by stopping the Union advance, forcing the boys in blue to fall back to their cannon line in the valley. Just before sunset, the Confederate Missouri Infantry under the command of General Mosby M. Parsons charged out into the Morton hayfield in hopes of overwhelming their foe. 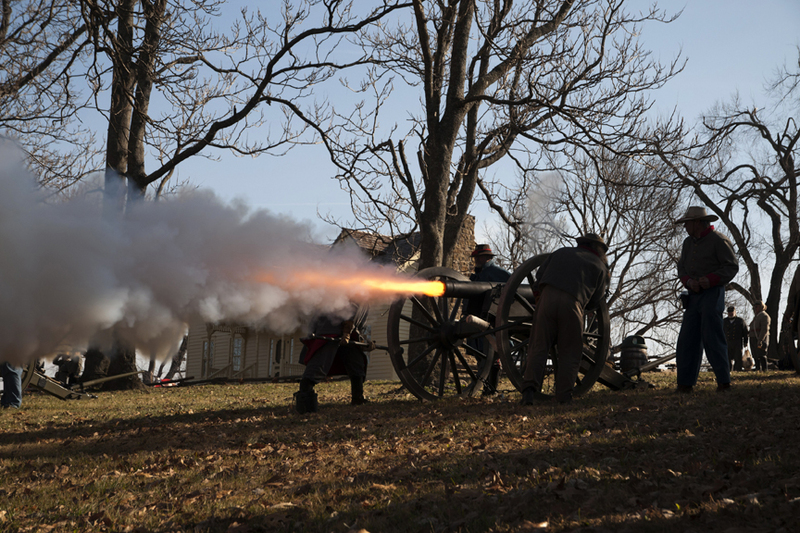 The intense fire from all forty-four cannons in the Union Army tore into the Southern ranks. The gray clad soldiers fell back to the cover of the trees as darkness settled over the field. The fighting on the western end of the ridge raged near the Morton House where four families huddled in the cellar for shelter from the storm of bullets and cannonballs above. Nightfall brought an end to the savage fighting with neither side gaining an advantage. The Confederate Army retreated during the night by wrapping blankets around the wheels of their cannons. They were short of ammunition and many of the men had not eaten for some time. The Union troops spent the night on the field with no campfires and only a few blankets, coats, and tents despite frigid temperatures. The two armies lost a total of 2,700 men who were wounded, killed, or missing in action. The battle was a tactical draw, but a strategic Union victory as the Federals would maintain control of Missouri and northwest Arkansas for the remainder of the war. The remainder of the conflict in the region descended to guerrilla warfare with bushwhackers (Southern supporters) and jayhawkers (Union supporters) destroying the countryside and forcing many families to become refugees. It would take many years for the people of northwest Arkansas to recover from the effects of the Civil War. Take a look at the Prairie Grove Battlefield State Park website for more information.